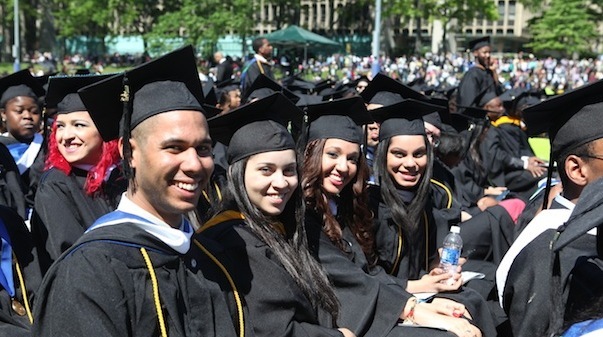 Under a brilliant blue sky and thousands of joyful smiles, Lehman College conducted its 46th annual Commencement exercises on Thursday, May 29. The College conferred more than 2,800 graduate and undergraduate degrees, one of the largest classes in the history of Lehman College. 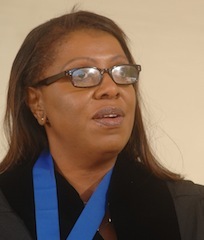 Addressing the graduates as they prepare for their first post-college steps was Letitia James, Class of 1982 and Public Advocate for the City of New York. She remembered her Lehman College experience as transformative and encouraged the graduates to take control of their futures. A native of Brooklyn, Ms. James earned a degree in psychology from Lehman College and later a law degree from Howard University. After serving in a variety of posts, including ten years on the New York City Council, Ms. James was elected Public Advocate in 2013, succeeding Mayor Bill de Blasio in the office. She is the first African-American woman to be elected to citywide office. She told the Class of 2014 to never stop learning or growing. View or download photos from the ceremony. Lehman College also conferred honorary degrees upon Valerie Capers, musician and educator, for her contributions to cultural life in New York City, especially in the Bronx; William Aguado, former Executive Director of the Bronx Council on the Arts, for his role as a cultural ambassador for the Bronx and work to highlight artistic achievements by Bronx-based artists; and Michael J. Balick, V.P. for Botanical Science and Director and Philecology Curator of the Institute of Economic Botany at the New York Botanical Garden, for his contributions in the study of plants and his decades of scholarship at the N.Y. Botanical Garden. Presiding at the ceremony was President Ricardo R. Fernández, who is concluding his 24th year as president of Lehman College. He encouraged the graduates to choose their goals carefully and make them worthy of the years of hard work and sacrifice invested in their educations. President Fernández was joined on the dais by Allan H. Dobrin, Executive Vice Chancellor and Chief Operating Officer of the City University of New York (CUNY); and Frieda D. Foster, a member of the CUNY Board of Trustees. Speaking for the Class of 2014 was Ibrahima Souare, a political science major with a concentration in international affairs and governmental law. A native of Guinea who speaks four languages – English, French, Susu, and Manike – “Ibro” plans to pursue a career in international business relations. Katina Rojas Joy, Deputy Director of the Business Liaison Office, U.S. Department of Commerce, received the 2014 Alumni Achievement Award. Ms. Rojas Joy earned a degree in Puerto Rican Studies in 1994. Marie Marianetti of the Department of History was recognized as Teacher of the Year. Wilma Borrelli of the Department of Sociology was recognized as Adjunct Teacher of the Year. Anne Rothstein, who served as Grand Marshal and teaches in Early Childhood and Childhood Education, was recognized for her 50th year of service to Lehman College. If you missed the ceremony, BronxNet will continue to air Commencement in the following weeks. Tune in to Channel 67 on Cablevision or Channel 33 on Verizon FIOS, or watch online here.